Published on September 29, 2007 in Health. Closed Tags: cuba, global, materialism, poverty, special period, universal health coverage, unrelated photo. 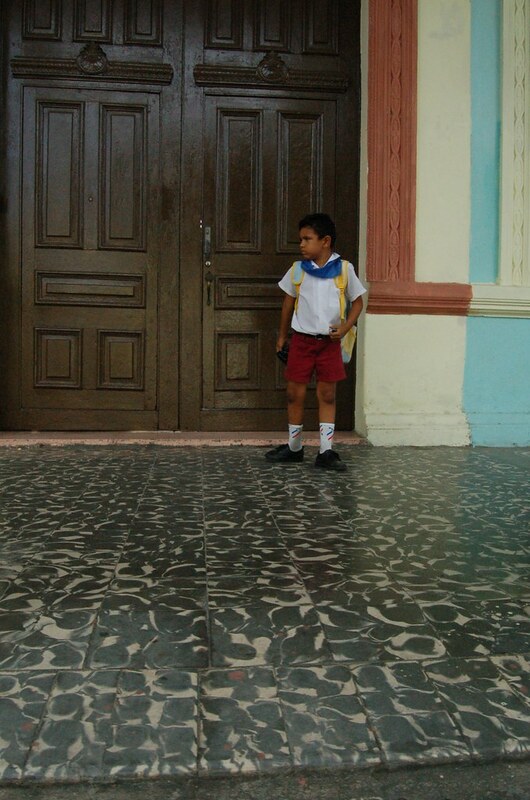 a distraught school boy in Camaguy by Isaac Holeman. My academic program here in Cuba revolves around learning Spanish, exploring Cuban culture academically and as a participant, and pursuing an independent photojournalism project. I’ve chosen Cuban Health Care as the subject of my journalism project. Just a few days ago, I was interviewing a prominent Cuban actress and her words struck such a chord with me that I’d like to share them with you. “I want to tell you a personal story. I am a cancer survivor. I was diagnosed in 1992; I had an operation, they did chemotherapy and gave me a medicine called tamoxicin. 1992 was in the Special Period, during which we had nothing. I don’t know why they call it the “Special Period”. “Special” usually means wonderful. But no, it was horrible. Horrible. You guys don’t know the meaning of “nothing”. Sometimes we ate just white rice with oil. And my husband, who is North American, never called his mother to tell her “Mom, we have no money, we don’t have shoes.” Never. He said, “I chose to live here and my problems are my own.” So in ’92 the food ration was minimal. When they operated on me, all of my coworkers gave me their rationed fish, their rationed chicken- protein so that I could get better. This is worth it. This is worth so much more than money. And I got all of my medical care for free. When I was in the US I had a friend who had terrible cancer and the chemotherapy cost her so much she couldn’t pay for it. The tamoxicin was costing her $499 a month. I took it for ten years for free. I have never had to pay a cent. And now they have me on a drug that costs $800 a month and I couldn’t live without it. So of course there are things that are worth it. There are good things that are worth fighting for. Nobody has to say “I’m going to die because I can’t pay.” How awful for someone to say “I won’t get treatment because I can’t pay.”And that the US, such a powerful country, doesn’t have a medical system that can take care of the health of its people, well that’s terrible, no? I know that Cuba has a lot of problems. Tons. I never, ever said that Cuba is perfect. I’m not religious. I don’t believe in perfection. I believe that all human beings have to fight to make life better. This I believe in. And I believe that people are good. And you can’t convince me of the opposite.